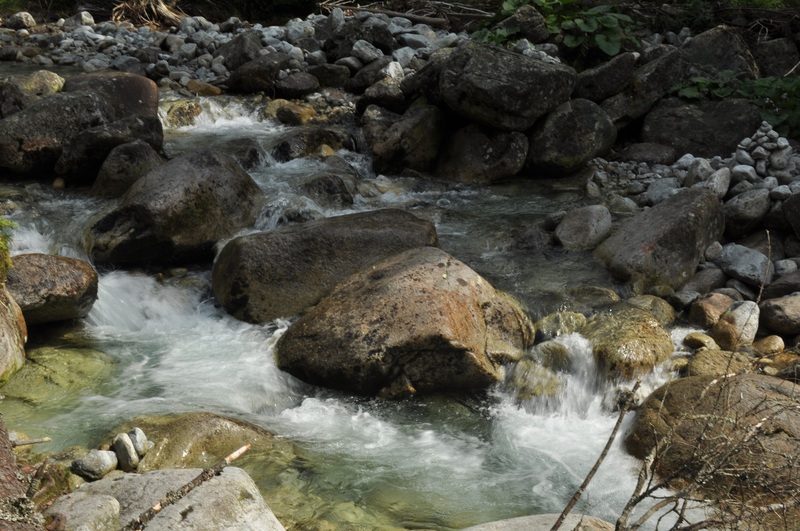 Finally after a long hiatus, here is part #4 from our hiking tour of Slovakia last summer. If you missed it, the previous article is the High Tatras Hike, part 1. 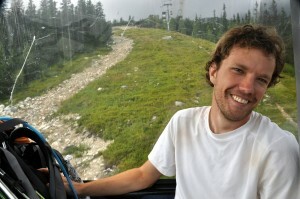 Before that, Alex and I backpacked across the Low Tatras. 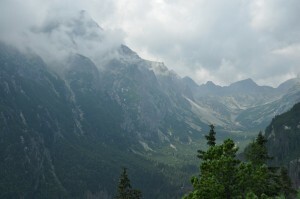 This was our hike #2 in the High Tatras. We checked out of the hotel in the morning and headed to the nearby train station. Just as we were getting ready to board the train, I realized my backpack was missing the bivy that used to sit outside! (A bivy is basically a waterproof sack for sleeping. It is sort of like a tiny one-person tent but without the poles.) I called the hotel, but they did not see it in the room. This was a bummer, I bought the bivy just before the trip and got to use it only twice before losing it. I started to like the little guy. I takes a bit getting used to, but there is no better feeling that falling asleep among tall grasses looking at the stars. I must have lost it on the bus to Poprad, along with my hiking pole. 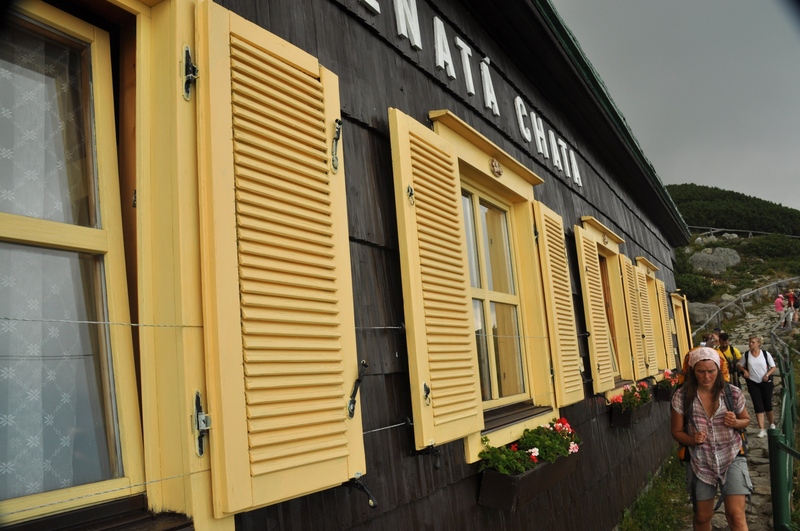 We took the train to the village of Starý Smokovec where we took the zubačka (fernicular) to a peak called Hrebienok. 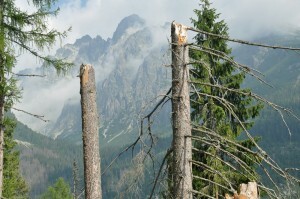 From there we continued on the red route to Skalnaté Pleso. The red route in the High Tatras is similar to the magistrála in the Low Tatras in that it’s a long trail that follows the entire mountain range. 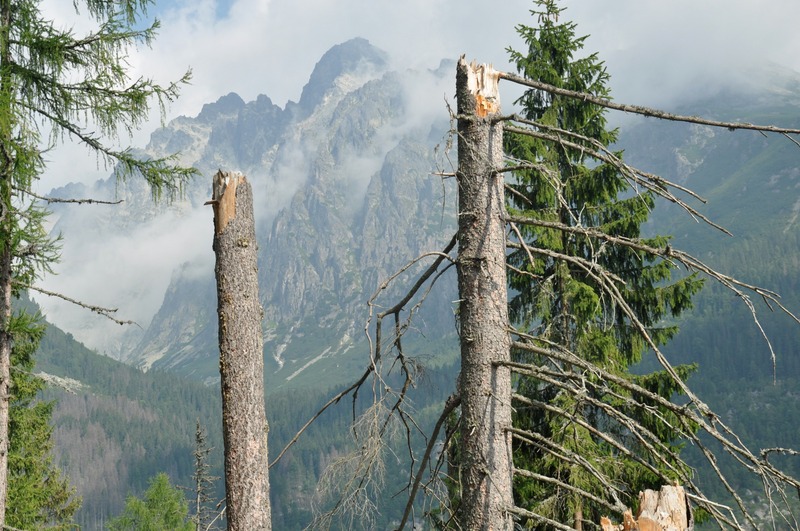 However, due to the more rugged nature of the High Tatras, the red trail generally follows the low valleys, and exploring the true beauty of the High Tatras requires trips along the side trails that take you to the majestic high country of mountain lakes and sheer granite cliffs. Scenery along the red route from Hrebienok. 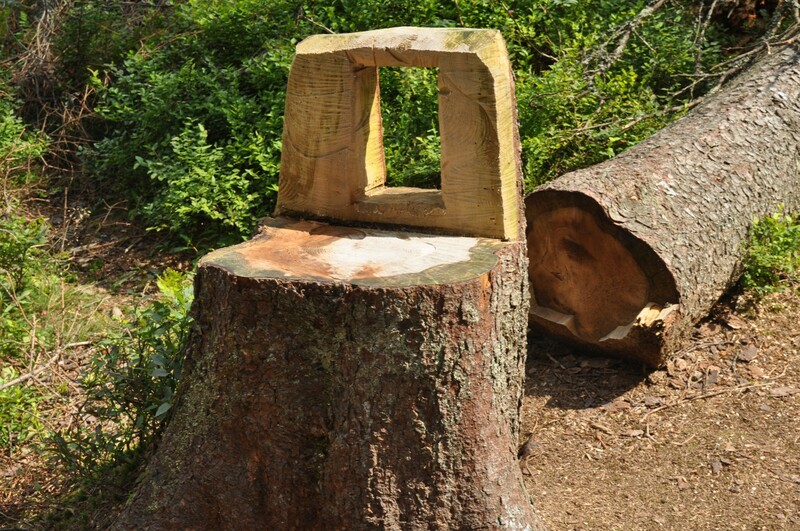 This area still had quite a few downed trees (perhaps from the storm few years ago), but some of them were transformed into neat chair. A brook and a waterfall along the way. 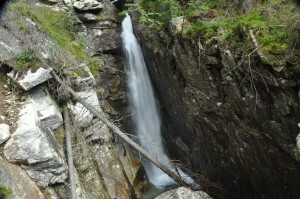 The name of this waterfall is Obrovský, which means “huge”. 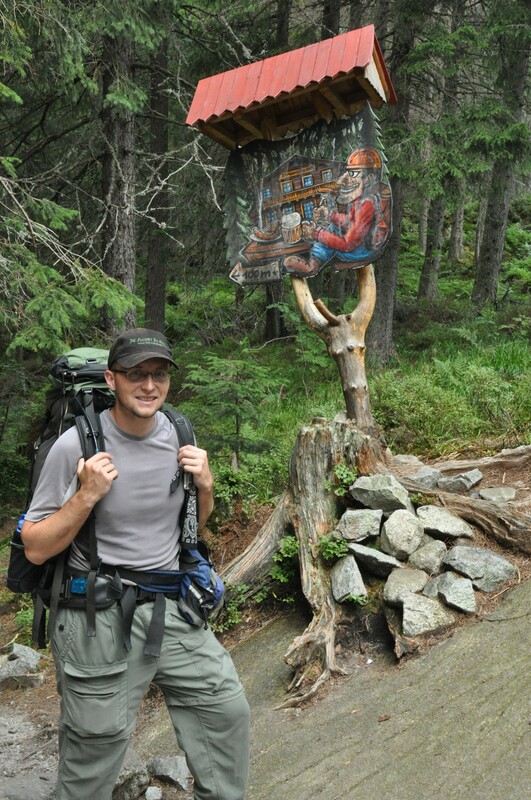 Here I am outside Zamkovského Chata (Zamkovsky Chalet), one of the many mountain huts dotting the High Tatras. 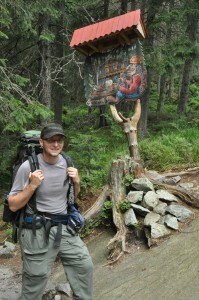 These huts provide shelter for overnight hikers, similar to the huts where we stayed while traversing the Low Tatras. Just past the hut you get a beautiful view into Studená Dolina (Cold Valley). The red trail to Skalnaté Pleso is really busy. Alex called this part “Disney Tatra”. There were people everywhere plus way too many kids on school trips. 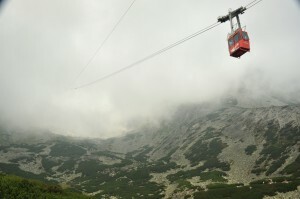 The Skalnaté Pleso mountain lake is popular because it is the base of a cable car up to Lomnický Štít. This cable car is extremely popular, and given the fact there is only a single car going up or down, the tram gets sold out days in advance. Such was the case today. But it was cloudy anyway, so we probably wouldn’t see much (unless the peak was above the inversion). We had few beers at the tram restaurant, and then headed down to Tatranská Lomnica on another tram. We managed to get down just us a storm rolled in. This was the first major storm we encountered on our trip. The downpour, lightning, and hail the size of quail eggs made us real happy to be sitting inside the Grill Pub. We had bryndzové halušky there. They tasted good but the dumplings were about an inch long! We sat on the patio, in the only seat that was not getting splattered on from the rain pounding the street. This is another hut, Skalnatá Chata (Rocky Chalet). 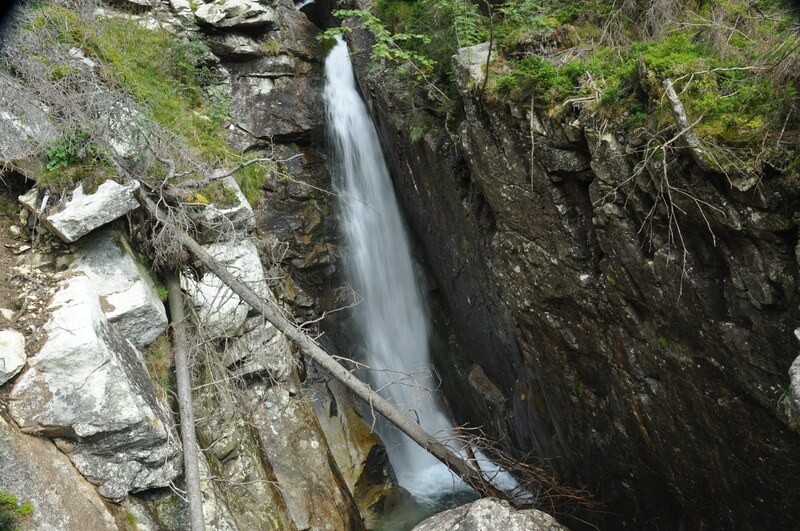 This one is located just below Skalnaté Pleso (Rocky Tarn). 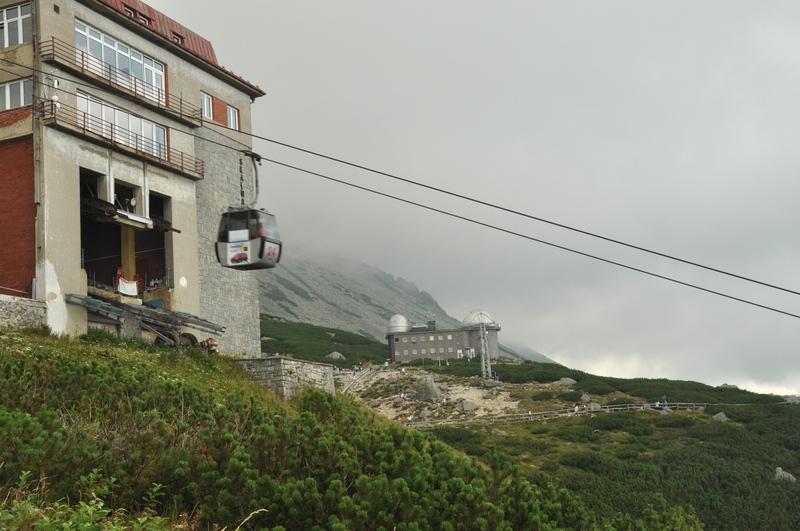 This is from where you can ride a cable car up into the clouds to reach Lomnický Štít. The tram to Tatranská Lomnica is much easier to catch – it runs continuously and there are multiple cars. We were planning to go to Červeny Kláštor (for rafting down the Dunajec) next but we were feeling a bit pooped so we decided to head back to my hometown of Banská Bystrica instead for a little rest. We got back at 7pm. While waiting for my dad to come get us, we ventured to the Koliba restaurant near my dad’s Kazačok pub. This was my first time there and it was quite neat. The middle of the restaurant has a fire pit in which the possibly actually cook the food. But it was really hot inside so we took a seat outside. The food was really good, although it was also quite pricey. I had some greasy but really deliciously soft stuffed meat. Next morning, after pillaging the empty fridge for moldy cheese and old mustard to go with sausages we got dropped off at Kúpalisko, a large outdoor public pool. Pools like this are quite common in Slovakia and I remember spending many summers here. It was really nice and relaxing. Much more than the one in Poprad, and cost only 3 Eur instead of the 17. Plus the girls were much cuter here :). The next morning we left for Slovak Paradise National Park. But that’s a topic of another post. My dream to visit Solvakia is within my soul, and to visit the home-land of my grandparents. You should go, it’s not as difficult as it may seem. Just fly in to Vienna and from there you can take an hourly bus to Bratislava. Then in Slovakia it’s easy to get around, buses and trains go pretty much everywhere. The only hard thing is deciphering the bus schedule, but most young people speak English and will be able to help.